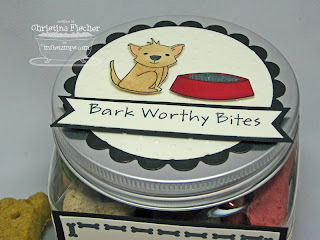 I used one of the two new label sets, Puppy Chow, on my first project. 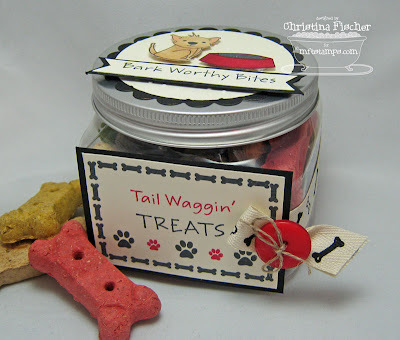 It's a doggie treat jar made with MFT Perfect Packaging. I don't have dogs, but we have plenty of neighbor dogs, so this will most likely be going to one of them! :) The button is from the Cup o' Buttons Summer Collection. 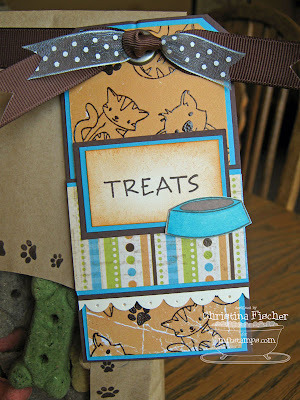 I combined images from the Puppy Chow and Purrfect Treats labels sets to make this tag. I stamped the images in craft ink and heat embossed with clear EP. I also combined the paw images to stamp a border around the bag window. Please join us tomorrow night from 8-10 pm Eastern for the Release Cocktail Party on the MFT Member Company Forum. There will be lots of chatter, more MFTeasers, and prizes, too! 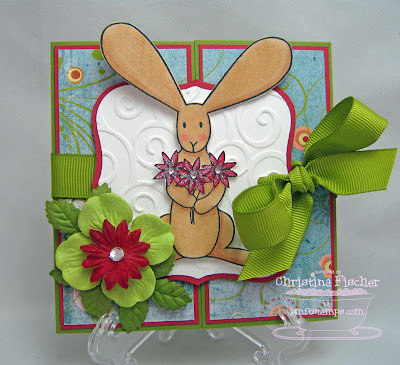 You're finished at my stop -- now hop on over to see what the fabulous Natalie Dever has created! I can't wait to see it either! :) Thanks for hopping by! Hello! Happy Tuesday! Today I have another MFTeaser, and this time the set is Catch Some Rays. It's the Who's That Girl set for July. I had a lot of fun with this set, and I have even more ideas for using it! 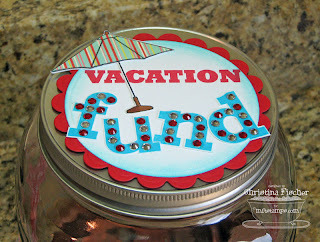 My first project is a Vacation Fund jar. I just hope I can fill it! :) In addition to the new set, I also used Bling 'Bet, Summer adornment crystals, Summer Collection papers, and Perfect Plaid Ribbon. 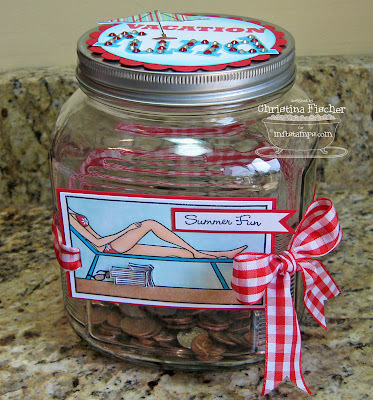 Of course, once you've saved your funds and taken that vacation, you'll want a photo album for all your photos! I had picked up a pack of three mini albums at Target a while back, and I altered one of them. The paper is from the Summer Cool line by Imaginisce. The buttons are, of course, from My Favorite Things. I hope you're lovin' the MFTeasers so far! Don't forget to stop back tonight at 10 pm Eastern for the Blog Hop! Then join us for the Release Cocktail Party tomorrow night from 8-10 at the MFT Member Company Forum! Oh, and if you haven't submitted your entry for the One Click Challenge, you still have a little time -- until 10 pm tonight! This Wednesday, July 1, My Favorite Things is releasing four new sets and a Polka Dot Ribbon Nest! We'll have a blog hop tomorrow (Tuesday) night to kick things off, then the party continues Wednesday night from 8-10 pm Eastern in the MFT Member Company Forum at SCS! There will be chatting, more MFTeasers, and prizes! We'll find out who the winner of the One Click Challenge is, too! Thanks for stopping by today! I hope your week is off to a great start! Hi, everyone! Happy Sunday! Here's a slow cooker recipe that is SUPER easy -- it takes about 10 minutes in the morning, and then you have a fantastic supper ready for your family after a busy day! I made it this week and it was a hit! Arrange vegetables in a slow cooker; place roast on top. Spread mushroom soup over roast, then sprinkle with onion soup mix. Cover and cook on Low for 9-10 hours. Now that we have Megan home from her trip, we're sending Kyle on one, too! He leaves this afternoon for a trip to Wyoming with a group of 26 Juniors from his high school. They will be doing hiking and horseback riding during the day, and they will have some retreat time in the evening. He'll be gone until July 5 -- please pray for a safe trip for all those boys and their chaperones! Thanks! Have a wonderful Sunday -- don't forget to spend some time around the supper table! Happy Saturday, everyone! I hope you have something fun planned for this weekend! Today I have a couple MFT Challenges to tell you about. The first is this week's My Favorite Challenge, which is to use paper piecing on your project. 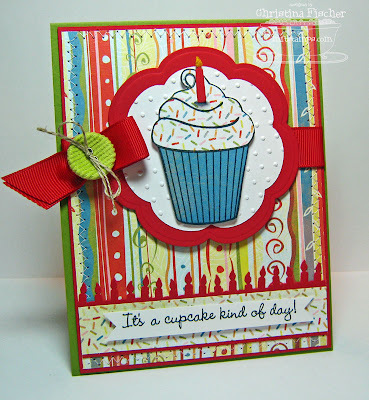 I paper pieced the top and bottom of this cupcake from It's a Cupcake Kind of Day!. The cupcake is cut out and popped up on the Blossoms Nestabilities. I used the candles punch on the bottom, and I put an extra candle on the cupcake. I used some yellow flock on the flame. You'll find this week's Sketch Challenge on the MFC Thread, too -- it's a good one! So, you can see you have a lot to keep you busy this week! ;) Thank you so much for visiting today -- I appreciate it SO much! Happy Friday, everyone! I have one more Verve preview for you today! This set is called Forever in Our Hearts, and it is a must-have set. Sympathy cards are often difficult to make, but the beautiful sentiments and images in this set make the task much easier. 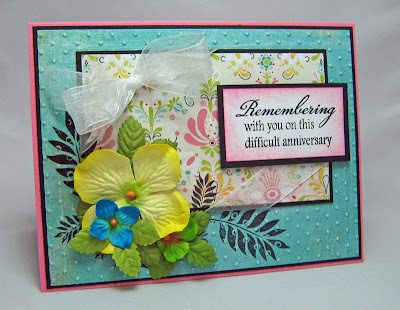 I used BasicGrey Urban Prairie paper, organdy ribbon, and Prima Caboodles flowers to make my card. I embossed the background paper with my Cuttlebug and Swiss Dots folder, then I stamped the leaf image over the embossing to create an interesting texture. I stamped the leaf again on the patterned paper to create a continuous image, then I arranged the flowers over the stamped leaves. 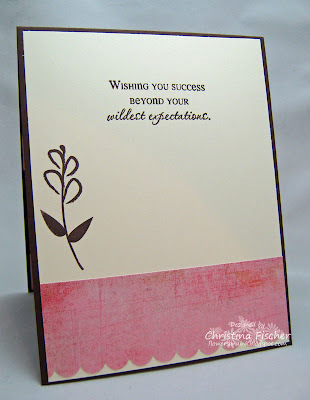 On the inside of the card, I used the smaller leaf image and another of the beautiful sentiments from the set. 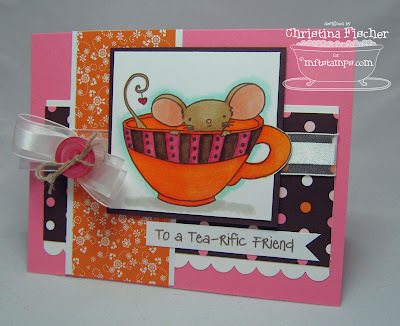 You can see more samples of this set at the Verve Stamps Blog. While you're there, you can find out how you can win your own set! Don't forget -- all the new stamps will be released tonight immediately after the Release Party at Splitcoaststampers. That's it for me today -- thanks so much for visiting! Hello, everyone! Happy Thursday! It's day two of the Verve Sneak Previews, and today's set is called Just for You. This set has beautiful sentiments meant to let someone know you care. Just For You and all the new Verve stamps will be available after the Release Party this Friday night. I made two projects with this set. The first is this card. It's a pretty simple design, but I just love this color combination! I used SU! Parisian Specialty dsp and Circle Nestabilities, and I embellished with ribbon, buttons, sponging, lace edge border and machine stitching. I really love this next project! When I saw this sentiment I immediately thought of gift tags. 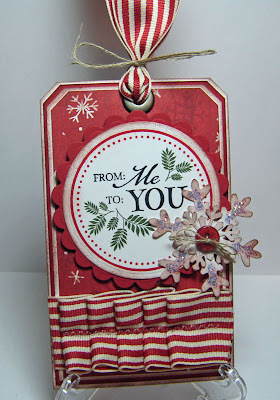 Then I ran across a scrap of Let it Snow paper (Flair Design), and this Christmas tag was born! I did some sponging with SU! Close to Cocoa ink around the paper panels and the snowflakes to give it a vintage look. I pleated and stitched the ribbon on the bottom, and I added Icicle Stickles to the larger snowflake. 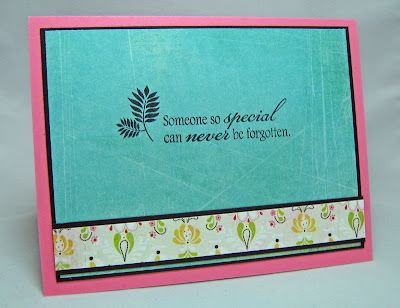 Stop by the Verve Stamps Blog to see more samples from the Verve Divas. While you're there, you can find out how you can win a set of your own! Hi, everyone! Happy Wednesday! I'm so excited to begin my Verve sneak previews as a June Guest Diva!! :) Today's set is called Kindred Spirits. It is filled with beautiful sentiments and fleur de lis images. 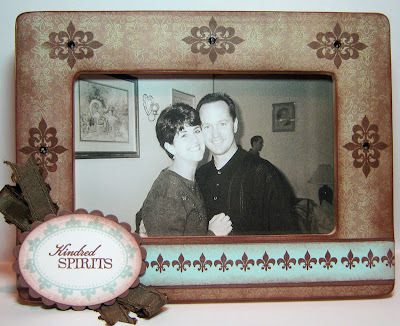 I used them on this altered frame I gave to Chris for our anniversary last week. This photo is about eight years old, but it's one of my favorites! It was taken at his brother's house during a family party. After covering the frame, I sanded and inked all the edges. Then I stamped the largest fleur de lis image several times, and I added brown Swarovski crystals to the centers. I used the smallest fluer de lis to create a decorative strip along the bottom of the frame. 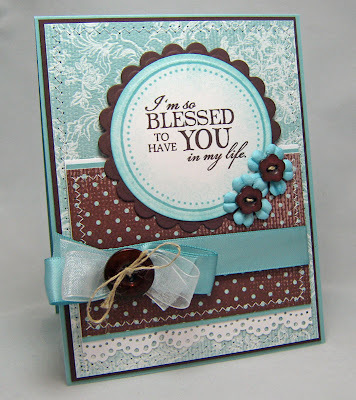 If you want to see more gorgeous samples from the Verve Divas, stop by the Verve Stamps Blog. 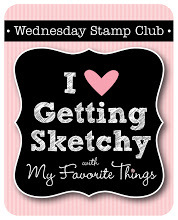 All of the new stamps will be released Friday night after the Release Party on the Verve Member Company Forum at SCS. I'll have another preview tomorrow, so I hope you'll be back! Thanks so much for the visit today! 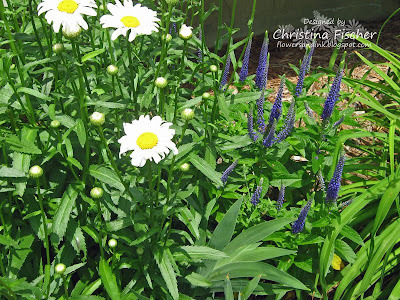 Our garden is filled with perennials and a few annuals, and it takes up the area around our backyard deck. 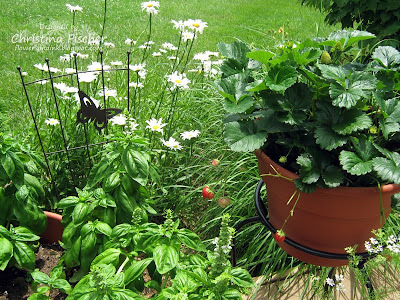 This first photo is of a few "edible" plants I have in pots on the deck: strawberries (right), basil (left), and cilantro (flowering in the bottom right corner). This photo is of the right side of the ramp leading from our driveway to the deck. The coneflowers are just starting to bloom. 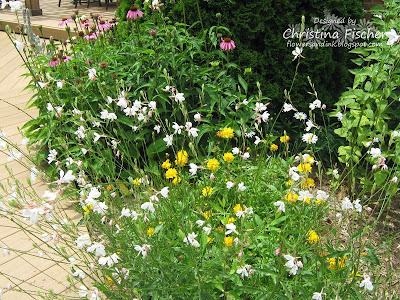 The white flower in the foreground is Gaura -- the blooms look like butterflies, and I just love its airy look. This area is one of my favorites. Just in front of it, not visible in the photo, is a small goldfish pond. 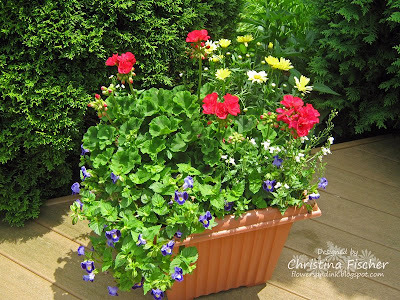 The climatis is still blooming, and the daisies and daylilies have just begun to bloom. 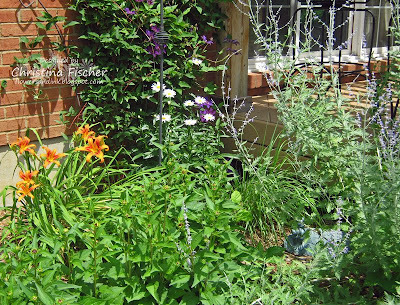 The Black-eyed Susans (foreground) and Russian Sage (right) will be in full bloom in just a couple weeks. One more shot -- I love the contrast of the purple and white here! Thanks for taking the time to stroll through my garden with me! 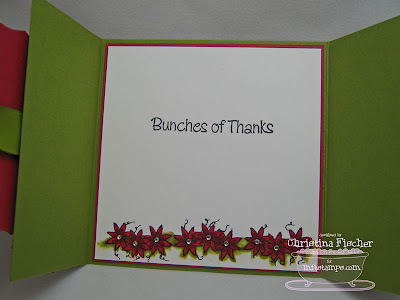 I'll be back tomorrow to share some stamping with you! I got a lot of stamping done over the weekend, but nothing I can show you yet! I did come across a project I had posted over at SCS but not here, so I'll share it with you today! :) I made this little gift box with Jody Morrow's Chalkboard Easel Template. 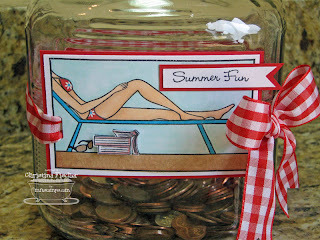 She designed it herself, and you can see some great examples of how she used it on her blog HERE. The best part is that it is available as a FREE download from My Favorite Things -- you can find it HERE! I had created this easel box a few weeks ago for the first My Favorite Challenge, which was hosted by Jody. 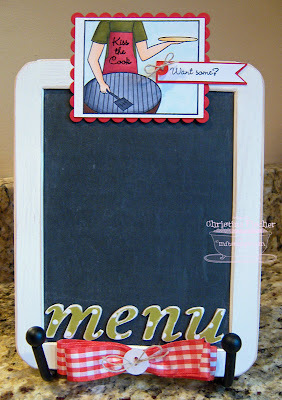 The challenge was to use her Chalkboard Easel Template -- you can find all of the challenge projects HERE. For mine, I used Owls and Bluebells on the front, and I colored with Copics. I really like the way it turned out -- I just love the colors! Happy Saturday, everyone! It's the 20th of the month, and that means it's Celebrate MFT Day! You already know that I celebrate My Favorite Things a LOT *grin* , but today we want you to celebrate with us! Just for a little extra fun, we'd like to know what your favorite Stephanie Fizer set is! Joanne has all the details HERE on the MFT Member Company Forum. Hello! Happy Friday! I was hoping to post this earlier this morning, but I was having technical difficulties! Today the All That Scraps DT is reviewing the Swiss Pixies. This is Gretel. I colored her with Copics, and I cut her feet "out of the box." I stamped a second wing on vellum and adhered it over the wing on the cardstock. 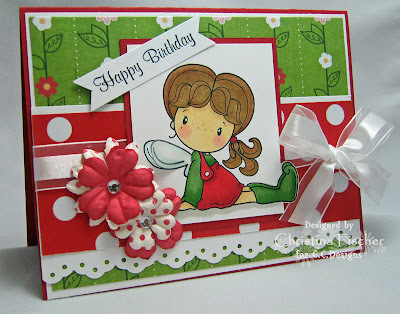 The sentiment is from Birthday Sentiments by AmyR Stamps. I hope your weekend is off to a good start -- thanks so much for stopping by today! Hi, everyone! Happy Thursday! 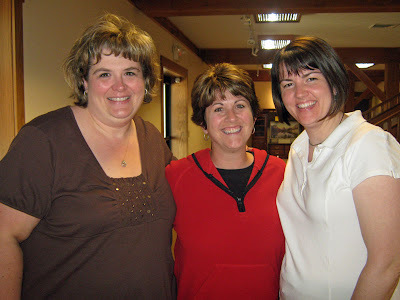 Joanne is hosting this week's My Favorite Challenge on the MFT Member Company Forum. The challenge is to make a gift card holder. I had fun making this card. The images are from the set Let's Hear It for the Boys, and the papers are from the Kaleidoscope collection by My Mind's Eye. I paper pieced the chair, then I popped up the arm and footrest on dimensionals. I also popped up the TV. I machine stitched around the paper panels. Quick Tip: When paper piecing, use a marker on the edges of the paper pieced images to create dimension. 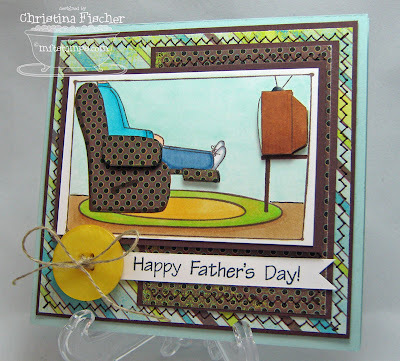 The other card I have to share today is for this week's MFT Sketch Challenge. I made this for my daughter Megan. She left last night on a plane with a group of about 30 girls from her high school -- they are on a 9-day tour of France. It was NOT easy putting her on that plane, but I know she's going to have the experience of a lifetime (you all keep reminding me of that, okay?)! The background paper is a map of France -- courtesy of Mapquest! I printed it out on SU! Whisper White cardstock. Megan begins her tour in Paris and ends in Nice -- I made sure both were pictured on the map (Paris over WTG's right shoulder, Nice next to her suitcase). I stamped the skyline image on the panels in Watermark ink by Clearsnap, and I heat embossed with SU! clear EP. The white crystals, ribbon and button are from My Favorite Things. Whew -- it's been a crazy couple of days! Between the MFT release and Megan leaving, I'm about ready for a nap! No rest for the weary, though -- I have more stamps that need to see some ink! I'm off to see what I can get done today! A Little Java to Get You (MFT) Hoppin'! 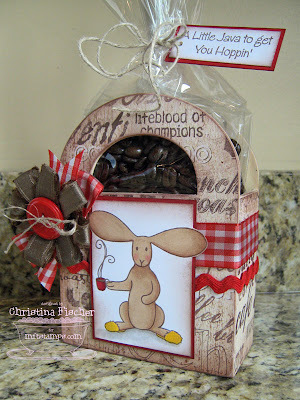 I used I Need Coffee Flopsey to make this fun gift box full of coffee beans. I covered the wooden box (purchased at Michaels for $1.99) with paper, then I sanded and inked all the edges. I embellished with ribbon and a button from the Cup o' Buttons Summer Collection. 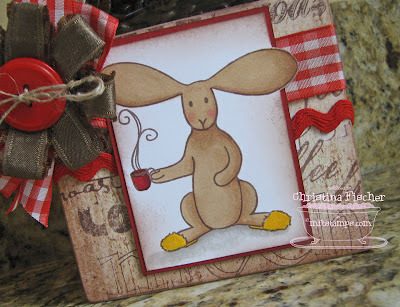 I stamped and colored Flopsey, leaving the ears "out of the box." I sponged around the edges of the image panel, then I added some yellow flock to Flopsey's slippers! The image panel is mounted onto the front of the box with dimensionals. Happy Monday, everyone! I hope you had a good weekend! 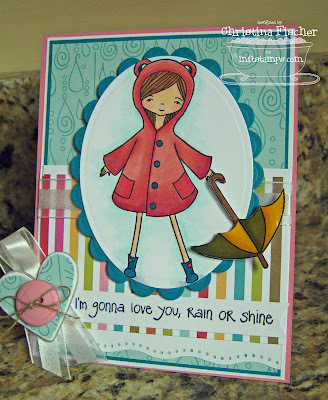 Today I have a MFTeaser of the set Rainy Day Friends, illustrated by Stephanie Fizer. It will be released by My Favorite Things this Wednesday, June 17. Hello, everyone! Today's Sunday Supper recipe comes from Gailanne. She shared it last week, and I'm happy to share it with all of you this week! It looks really yummy -- I can't wait to try it! It serves 2-3, but you could easily double (or triple) it! Thank you so much, Gailanne! If anyone else has a recipe to share, just email me. I'll be happy to feature it here on Sunday! Thanks so much for visiting -- don't forget to spend some time around the supper table! I paper pieced the buggy with the reverse side of the flowered paper, and I used silver brads on the wheels. Some Primas, rhinestones, and a border punch finish the design! 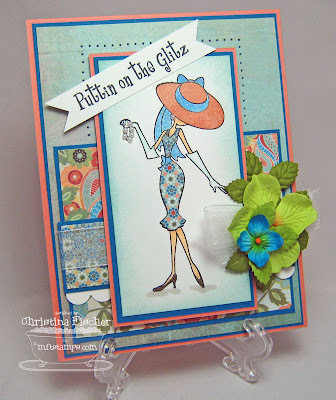 Stop by the ATS Blog to see what the other girls have done with this set! Thanks so much for stopping by today -- I hope your weekend is off to a great start! Hi, everyone! It's Thursday, so that means it's time for the MFT My Favorite Challenge! 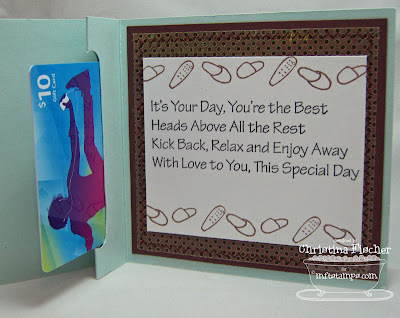 This week, Joanne and I challenge you to make a trifold card. You can find all the challenge details HERE on the MFT Member Company Forum. For my sample, I made a gatefold card with the set Flopsey's Flowers. I colored with Copics and cut Flopsey out. I added glitter to the flower petals, and I adhered rhinestones to the flower centers. Thanks so much for visiting today! It's always great when you stop by! Happy Wednesday, everyone! 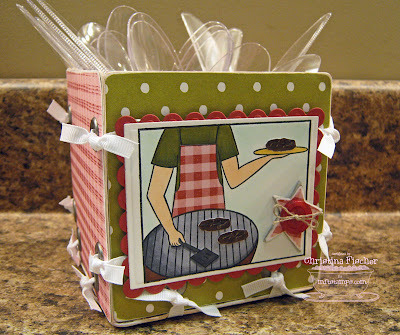 Today I have the All That Scraps Wednesday Challenge for you! This week's challenge is to use the Grid Technique. This adorable image is Heidi, one of the Swiss Pixies by C.C. Designs. I colored her with Copics and cut her out. I applied Icicle Stickles to her wings, and I popped her up on dimensionals over the embossed oval. The grid panel reminded me of lattice, so I used a leaf from Sugarplums Scenery to create a leafy vine. I drew in the vine, then I cut out the leaves and mounted them on rolled up Glue Dots. That's it for today! All of my kids are finally out of school, so I think we'll be finding something fun to do! Thanks so much for the visit today! Happy Monday, everyone! 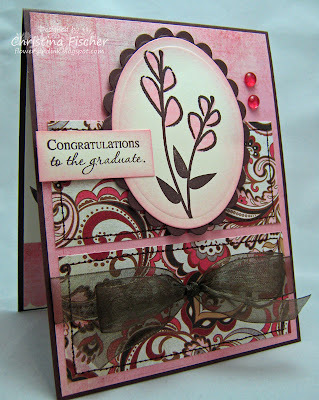 Today's card is one I made for a friend's daughter for her high school graduation. I decided not to use the typical graduation images, but I instead created a more feminine design to celebrate what a fine young woman she is. 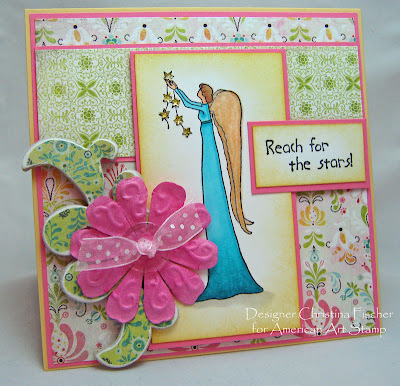 The flower images are from Serenity, and the sentiments are from Great Expectations, both from Verve Stamps. I finished the inside as well. Thank you so much for visiting today. I always appreciate it when you stop by! That's right! I know it's been a while since I've posted a Sunday Supper recipe. Truth be told, our schedules got entirely too busy and I didn't have a chance to try new recipes! Now that my oldest is driving, we're in more directions than ever, so I am making an effort this summer to be sure my family meets around the table a few times a week. It's a way to be sure we all reconnect and get on the same page! This week I tried a new slow cooker recipe. It is from Slow Cooker Recipes by Gooseberry Patch. Slow cooker dishes are the way to go during the crazy days of summer -- you can put it all together in the morning and not worry about it until supper time! My family had rave reviews for this recipe -- I served it with salad and garlic bread. Arrange chicken in slow cooker. Top with mushrooms, green pepper, water and half of sauce; sprinkle with seasoning. Cover and cook on low for 4-6 hours. At serving time, warm remaining sauce and toss with cooked spaghetti. Top spaghetti with chicken; sprinkle with shredded cheese. Happy Saturday, everyone! Here's a card I made with stamps from American Art Stamp. The image is Angel with Stars by Adriana Cirstea, and the sentiment is from the set Inspirational Words by Kathleene Callei. The paper is Urban Prairie by BasicGrey -- I just *love* the colors in this collection! I applied some of the paper to the Maya Road chipboard, then I sanded the edges. I colored the image with Copics, and I sponged around the panels with SU! So Saffron ink. To give the wings some shimmer, I painted them with some Moonlight Smooch by Clearsnap. I purchased the star-shaped adhesive crystals when I was at Toyrifix last weekend, and they fit the stars on the image perfectly! I colored them with a Copic marker before applying them. Thanks for visiting today -- have a wonderful day! Beginning last week, we changed the weekly MFT challenges just a bit. There is no longer a Who's That Girl? Challenge on Monday -- it is now the My Favorite Challenge, and it is posted on Thursday, along with the MFT Sketch Challenge for the week. I'm thrilled to still be co-hosting the My Favorite Challenge with Joanne! More MFC details and this week's MFT Sketch Challenge can be found on the My Favorite Challenge Week 2 thread HERE. 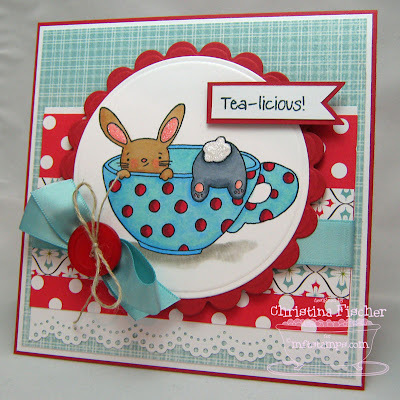 This week we're challenging you to use three different patterned papers from three different collections. They can be from the same manufacturer, just not the same line! 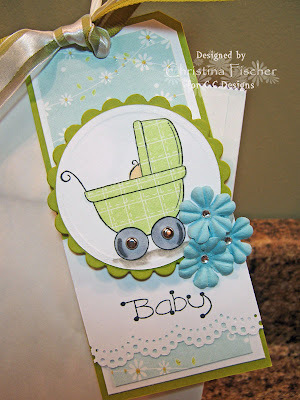 On my card, I used Parisian Specialty dsp (SU! ), Craft Fair (American Crafts), and Ski Slope (SU!). the image and sentiment are from Tea for Two. Here's my card for the Sketch Challenge. I used the just-released set Let's Picnic, and the paper is SU! Bella Rose.You can find out how I made my flowers in the MFT Tips & Tricks thread. Thanks so much for visiting today! Have a fantastic Friday! Grillin' and Chillin' with MFT! 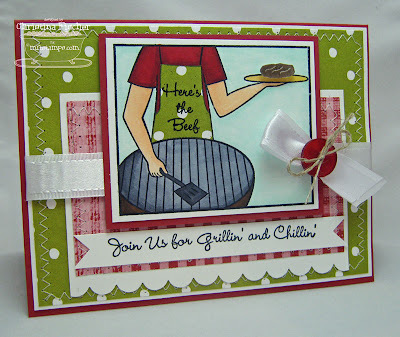 All of my projects are made with Who's That Grillin' Guy?, one of three sets being released tomorrow (Wednesday) night! 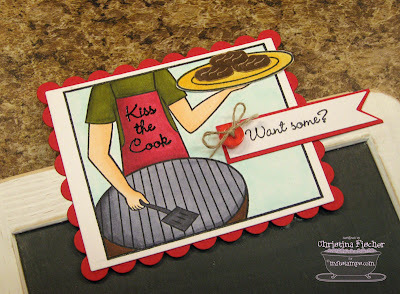 You're invited to a cookout!! First up is the invitation. 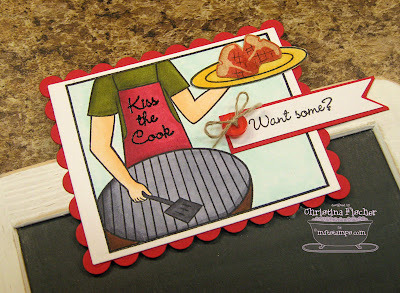 I heat embossed the letters on the apron so they would show up better against the paper. The burger is cut out and popped up, and I gave it a coat of Crystal Lacquer so it would look nice and juicy! :) The button is from the Cup o' Buttons Summer Collection, and the ribbon is from the Royalty Ribbon Nest. And once you get to the cookout, you'll want to know what's on the menu! I altered a chalkboard by painting and sanding the frame and adding chipboard letters to the bottom. You'll notice that his plate is empty -- that's so I can change it to suit the menu! ...and if burgers are on the menu, he'll be holding the burger platter! I can keep both platters in a small envelope behind the menu board. And finally, here's a flatware caddy to hold your utensils! I covered chipboard coasters in the same paper I'd been using for the other projects, then I tied them all together with ribbon. On the image, the burgers are again cut out, popped up, and coated with Crystal Lacquer. Join us on the MFT Member Company Forum Wednesday, June 3, from 8-10 pm Eastern for the MFT Release Cocktail Party! The MFT Sweet Sixteen will be announced (including 2 new designers! ), and we'll also announce the winner of the One Click Challenge -- she will receive the entire release free!! 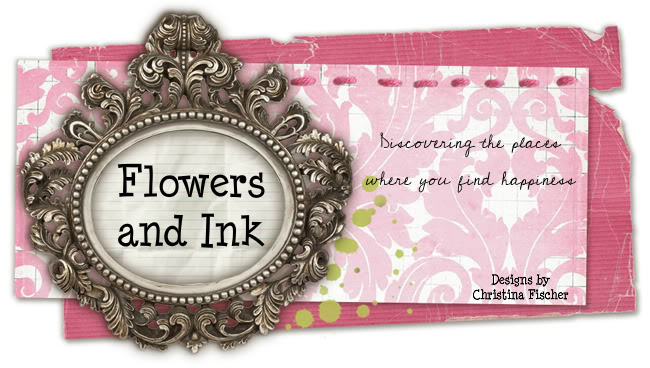 The fun will begin TONIGHT at 10:00 Eastern with the Release Blog Hop!! It's sure to be filled with lots of great projects and designs, so I hope you'll check it out! Sets being released: Let's Picnic, The Poppies, Who's That Grillin' Guy? Anyway, I'm back and ready to get to work! Here's an MFTeaser of the new MFT Presents set by Stephanie Fizer. Meet... The Poppies! They remind me of Josie and the Pussycats -- remember them?? 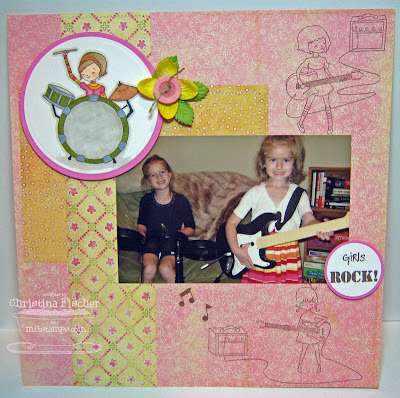 :) I love this set so much that it inspired me to make -- hold on to your hats -- a SCRAPBOOK page!! Right away I thought of my girls playing Rockband, and this photo was just perfect to use with the set. The paper is Wild Raspberry by K & Company. I machine stitched around the panels. I thought it would be fun to color only one of the images and to stamp the other two directly onto the dp. I think it turned out pretty cute, considering I NEVER scrapbook! ;) I can't wait to use this set some more! My Favorite Things is releasing three new sets on Wednesday, June 3, and the party will be on the MFT Member Company Forum from 8-10 pm Eastern. The MFT Sweet Sixteen will be announced, including two new designers, the One Click Challenge winner will be announced, plus there will be lots of chatting and fun! We hope you can join us! Don't forget: the All That Scraps release party is tonight from 8-10 pm Eastern! I'll be back tomorrow with another MFTeaser for you! Thanks so much for visiting today!